I'm not very nice. Just ask my cat. The reason I'm telling you this is I was planning to write a blog post comparing self portraits- two by Rembrandt counter posed to one by the early 20th century Swiss artist Giacometti. I knew at some point I'd seen some not terribly impressive self portraits by Giacometti and went to Google Images to hunt down one I really didn't like. I knew the Rembrandts would blow the Giacometti out of the water. That's when the trouble started- this one came up first. 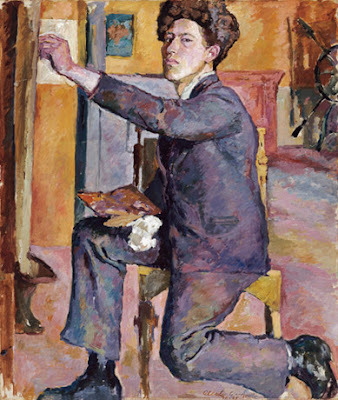 It's an oil Giacometti painted of himself in 1921. Leaving aside the question I always ask of why anybody would paint wearing a suit, I had to confess I kinda liked this one. So, saving the Rembrandts for a later post, let's look at this pleasant surprise of a painting. In its cramped spaces, Giacometti manages to give us a pretty expressive painting. He'd absorbed most of the modernist impulses that happened with the various painting movements that followed on the heals of the French Impressionists- arbitrary color choices, flatter spaces, and super loose brushwork that keeps your eye aware you're looking at paint on a surface rather than at a painting that's trying to mirror reality. Within the confines he chose to work within, I have to admit he did a fine job of it. In particular, he posed himself to make a tightly organized composition that has a nervous pulsing energy to it. Look at the silhouette of the body. There's a well orchestrated dance going on where diagonal limbs contrast against the verticals and horizontals of the architecture. While mostly leaning this way and that, Giacometti's body sometimes lines up with the geometry of the verticals (the buttoned front of his jacket or the inside seam of his left lower pant leg). And in a few places he generates some purely horizontal lines (the bottom seam of his jacket that lines up cleverly with the front edge of his chair). Way in the background we see a big metal etching press (hope it wasn't a fifth floor walk up for whoever had to move that in). One of its arms points diagonally down and back toward the artist. See how the back of Giacometti's right thigh repeats this trajectory across the painting's surface exactly. None of these compositional ideas were new. Rather they grew out of a centuries long tradition of painting the figure within architecture. Though a thorough going modernist, Giacometti knew the old painters had mastered a language of expressing themselves through purely visual forms. How they drew their shapes controlled how the viewers felt as they looked at the their paintings. While he was one of the innovators of 20th century painting, Giacometti knew he had to speak the visual language that painters had been building up all those preceding years. There is an unmistakable early 20th century feel to this painting. It couldn't have been painted in 1821 instead of 1921. But it couldn't have been painted at all had the artist not grasped the visual tools that had been handed him by the legions of artists who'd gone before him. None of us artists are re-inventing the wheel. It rolls on smoothly when we find within ourselves the stories we are meant to tell. Giacometti in this painting proved a good story teller. Thanks for finding this. I had never seen it. It reminds me of Modigliani's "Caryatids", which were as you pointed out, architectural. So, will we be seeing any Philip Koch Self Portraits? Ski- I might just post one.